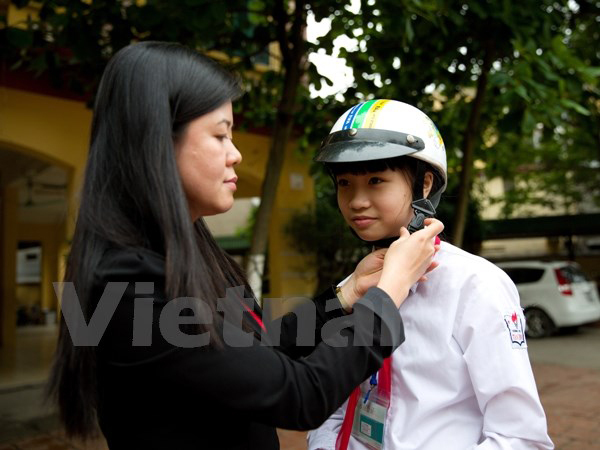 HA NOI (VNS) — A traffic safety week, with the theme "Children and Traffic Safety", was launched this morning in Ha Noi. The week was launched by the National Traffic Safety Committee, in co-ordination with the Asia Injury Prevention (AIP) and the World Health Organisation (WHO). During the week, which will last from May 4 to 10, information about typical reasons for traffic accidents and consequences of traffic accidents for children will be disseminated across the country. The event is aimed at raising the community's awareness for protecting children from traffic accidents, said Khuat Viet Hung, deputy chairman of the National Traffic Safety Committee. WHO statistics showed that more than 186,300 children in the world die due to traffic accidents per year, which is equivalent to 500 children per day. In Viet Nam, nearly 2,000 children die per year due to traffic accidents. "Traffic accidents have become a great threat to children's lives," said Hung. Traffic accidents are one of four first reasons for fatalities among over-five-year-old children, he said. "Traffic accidents cause immense pain among thousands of families and threaten countries' development. All of us hope to prevent the disaster," said Hung. Greig Craff, chairman of the AIP, said Viet Nam should spread traffic safety culture from schools and families. Viet Nam was one of countries that had taken the lead to vaccinate children, and encourage them to wear helmets and make them realise that this was as important as giving them vaccination. It was important to vaccinate them, said Greig Craff. Manu Eraly, a representative of WHO in Viet Nam, said many children driving electric bicycles without helmets had led to serious consequences after traffic accidents. Children's helmet quality should receive more attention, he said.